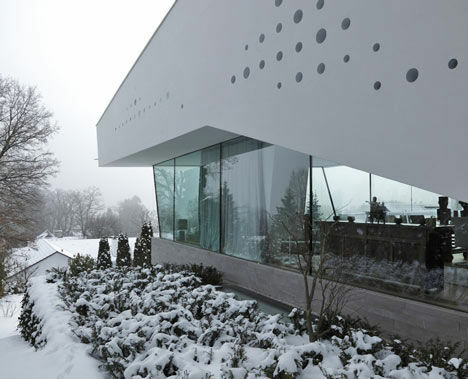 Crisp and clean, ‘House R‘ by architecture studio Bembé Dellinger looks right at home in the snowy winter landscape of Schondorf, Germany. 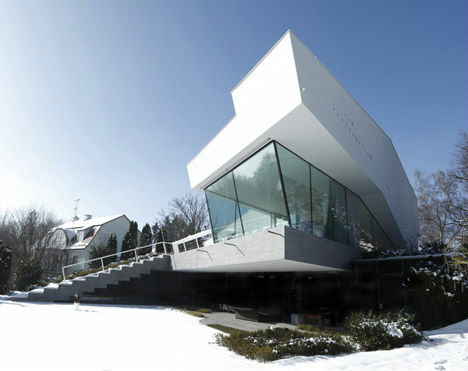 Perched on the edge of Lake Ammersee, the multi-story cantilevered home provides elevated views of the surrounding land through floor-to-ceiling windows. The glass walls blur the distinction between indoors and out, and flood the interior with natural daylight. Inside, large expanses of white are punctuated by 380 clear acrylic cylinders, which provide subtle points of illumination. 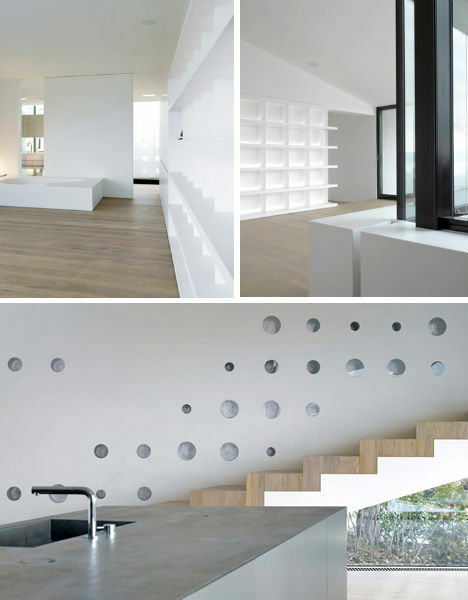 The interior is characterized by lots of blocky built-in surfaces and niches, like a wall of display shelves and a bathtub open to the main room. Black framing around the windows and a light wood floor break up what would otherwise be an entirely monochromatic indoor space. Angular white designs are a recurring theme in the architecture studio’s portfolio. Placing many of these modern structures outside large cities, Bembé Dellinger creates homes that represent a notable shift away from the suburban archetype of the past half-century.